Even though I’m really happy with the results of my skincare routine as far as smoothing out some fine lines and preserving what I’ve got, the uphill battle is getting steeper and steeper as time marches on. To say I wasn’t diligent about sunscreen when I was younger would be an understatement as huge as me saying “I kind of like sheet masks.” I’m working against over a decade of deep UV damage, which causes the premature breakdown of collagen and other fun things. And that’s why I finally bit the bullet and decide to take advantage of PocketDerm’s one month free trial (referral link). PocketDerm is an innovative teledermatology service that provides online dermatologist consultations with a very affordable ($19.95 each month for anti-acne or $49.95 every three months for anti-aging) custom-blended prescription topical medication that’s whipped up to fit each patient’s needs. My first month’s prescription will deliver 5% Magnesium Ascorbyl Phosphate (MAP) vitamin C, 4% niacinamide, and 0.012% tretinoin (my first prescription retinoid, so pray for me please) and is targeted at fading dark spots, improving my skin texture and firmness, and smoothing out and preventing fine lines and wrinkles. After I use it for a while, my provider and I will reassess to see if I want to continue with that combination or experiment with something different. I’m all wiggly with excitement and nerves. I’ve been contemplating trying out prescription topicals for a long time now. I finished my registration and uploaded my photos over the weekend. My PocketDerm doctor got in touch with me yesterday with her assessment of my skin. My prescription shipped later the same day, and because I live about 45 minutes away from PocketDerm HQ, it’s already on the mail carrier’s truck and scheduled for delivery to me today! On the one hand, I’m really excited about this. I’ve heard great things about PocketDerm’s service and product, and I’m really stoked to see how much a prescription can accelerate the skin improvements I’ve been getting. On the other hand, man, I’ve heard some pretty scary stories about the dryness, irritation, flaking, peeling, and purging that can accompany the first few weeks on prescription retinoids. I’ve laid in a good supply of hydrating, moisturizing, and soothing sheet masks. I’ve also made my peace with dropping my acids from my routine for a while. But like I said, pray for me. 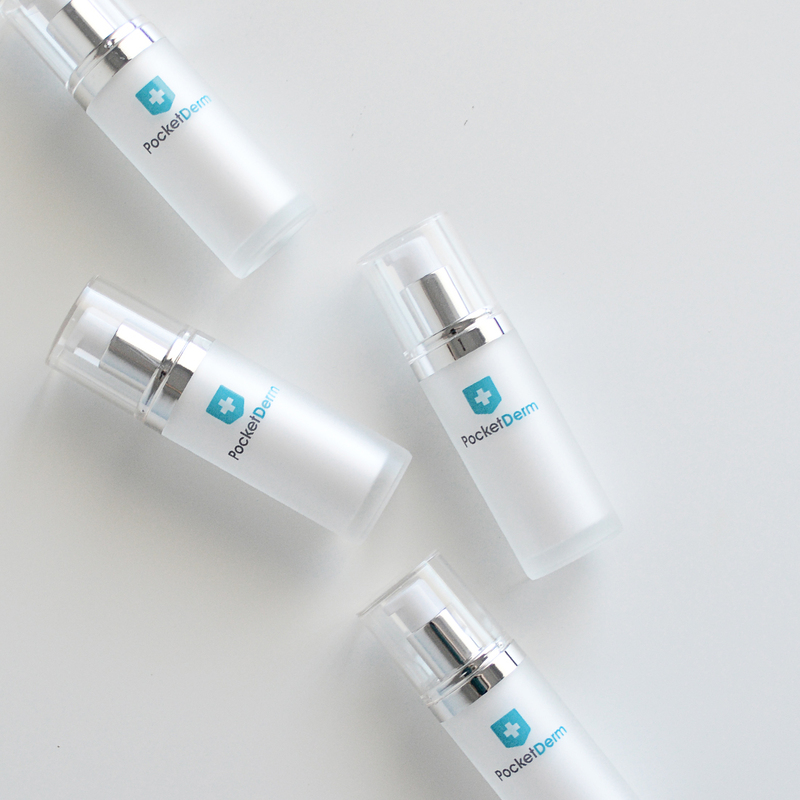 Have you tried PocketDerm? If so, what did you think? I’ve been SO tempted to try that one month trial but have been putting it off because, like you, I’ve read so many horror stories about the dryness, irritation, and flaking that accompanies those first few weeks on prescription skincare. Maybe I’ll take the plunge after you give us a (hopefully) good update? I love me some PD! I use the one for acne with 4% Niacinamide, 1% Clindamycin, 4% Azelaic Acid, so I can’t say how drying Tretinoin is but my skin is loving this formula. It’s only been a month since I started using it and I’ve seen big improvements! My skin texture is softer, pigmentation is fading, and hormonal acne heals faster. Not only that, but my Dr. is super responsive and really informative about any questions I may have. I’m super happy with the product and service so far and I’m sure you will too. I’m still incorporating acids back into my routine, but it was actually kind of nice break of not having to wait 20 mins in between steps! I was literally just thinking about how I won’t be doing acid wait times tonight! Where in your routine do you put your PD? They say you can add PD before or after your moisturizer but to wait a few minutes in between. I just follow my routine as normal, add PD after my ampoule, wait a few, and then sleeping pack. I signed up and then chickened out – I think you may have given me the balls to go back and do it. Ain’t getting any younger!! i’m interested in how it works for you! since starting an ab routine, i’ve been seeing pocketderm talked about but hadn’t looked too much into it. i’m shocked at the pricing which seem really reasonable! i was on tretinoin and hydroquinone via obagi for over a year. during that time, i was [i think wrongly so] advised not to add in extra moisture. i’m looking forward to slowly incorporating it into my ab routine. i think my skin will be able to handle it much better now. I would think you would actually do really well. You already have mega-moisturizing going on in multiple steps. I’ve had a hard time because my skin was (and still is) on the oily side, so I just didn’t have the right products to combat peeling. I finally gave in and got Ceramidin liquid and a heavy duty occlusive so hopefully that will help. Oh, and your konjac sponge is going to be your best friend again! Purging has consisted of a small breakout on my chin in the same place I was getting monthly breakouts before, which got significantly worse when I decided that 3 weeks into tretinoin was the PERFECT time to go ahead and add C20 to my routine. Don’t do that is my advice. When you can add your acids back in gently, it will help a lot with any dead skin, but your pores should be in really good clean shape and prevent purging. But anyway, PD is really great! I’ve been on the standard acne formula (clinda, azelaic, niacinamide) for 2 full months now, and while I can’t say that my skin is clear yet (it gave a nasty purge, and now I overirritated my skin trying to combat the purge–my fault :(), the 24 hour access to a dermatologist’s advice is HEAVENLY. I love how professional and patient they are! Would definitely recommend! Oooh, thanks for the correction! I’ll go fix that in the post right now! Wish we had Pocketderm here! That being said, just a few days ago I jumped the gun and got myself prescription tretinoin in 0.025, so fingers crossed for the both of us. I think your multitudinous, super hydrating routine is perfect for mitigating the harsh side effects of tretinoin. I think so too! I’m really glad now that I’ve got such a surplus of hydrators and moisturizers on hand! Have you had any experience with products containing rice? I have! I like the Skinfood Rice Mask a lot–it’s a gentle scrub. And as a matter of fact, I’ve got the COSRX rice mask coming to me to try out 🙂 You’ll hear about it here soon! This is my first prescription retinoid too! I’m excited but also a bit nervous! I hauled a ton of face oils in preparation. It’s also been a few months since I’ve used any sort of retinoid so I got a deluxe sample of Sunday Riley luna to break my face in! Really excited!! That’s a low tretinoin percentage. Isn’t 0.01% tret equivalent to 1% retinol or something like that? So it is just slightly more than an OTC retinol. I was started off at 0.08%! In retrospect way too high, so I had the horrible embarassing molting of the scales. When I switched to the Acne prescription, my tret was lowered to 0.06% and I could see a huge difference in the reduction in sensitivity and flaking. Yeah, I asked for a pretty low percentage to start out with, because I was really nervous. I imagine we’ll go up at least some next month! IMO, most people could avoid flaking and extreme dryness if they would be more gradual about it and cut back when they start having problems rather than just trying to “push through it.” Purging is another story though, no avoiding that. But I imagine that since you have clear skin, it won’t be a big problem for you. Your cautious approach and your arsenal of hydrating products should make this go well, I wouldn’t worry! Tretinoin is a game changer! When my skin starts feeling especially dry due to tretinoin, I just layer Benson’s steam cream. If I’m really feeling the dryness, a sleeping pack to lock it all down seems to do the trick. Mind you, my skin seems to tolerate tretinoin well. I’ve never had more than mild flaking and some dryness. Good luck! Stick with it unless you’re allergic. It is the one thing I can’t live without in my skincare regimen. I would rather give up most of my other products than this. I’m pretty excited about it and adjusting well! Actually, my PD provider agreed to bump me up to 0.02% with my next shipment, so I’ll be taking things up a notch. Excited~! My skin is still far from perfect, but it gave me skin I never thought I could have. LOL. I use 0.05 and that seems to make my skin happy. Keep us posted on your progress! Can you please let me know how did you get the anti aging package pricing? I stared to sign up for the free month trial but even after I selected skin concern as Wrinkle and followed through the process, the website said that i will be billed 19.99$ a month, which is the acne pricing. Since PocketDerm rebranded to Curology, they simplified their pricing structure. It’s all $20/month now.